What does a vegetarian diet mean? What vegetarian menu is recommended? What special nutrients does vegetarian need? Does a vegetarian diet have any benefits? A vegetarian diet is not a diet in our common meaning, it’s most likely way of life. People have different reasons to refuse to eat animal product,such as vegetarian's family upbringing, religion, animal rights and others. 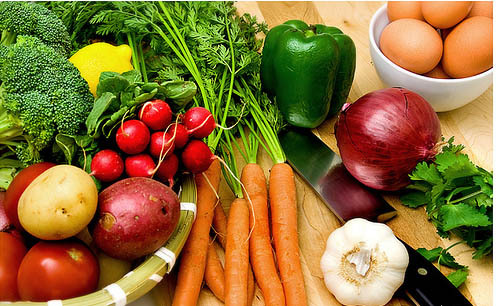 Many people choose a vegetarian diet in order to promote good health. A vegetarian diet means to take plant-based foods, such as whole grains, nuts, legumes, fruits and vegetables. This diet has more fibre and contains less saturated fat. •The vegan or total vegetarian diet contains only foods from plants: fruits, vegetables, legumes (dried beans and peas), grains, seeds and nuts. •	The lactovegetarian diet contains plant foods plus cheese and other dairy products. •	The ovo-lactovegetarian (or lacto-ovovegetarian) diet also contains eggs. •	Semi-vegetarian diet doesn't allow red meat but contains chicken and fish with plant foods, dairy products and eggs. Is a vegetarian diets healthful? The American Dietetic Association (ADA) has officially approved vegetarianism. ADA has said "appropriately planned vegetarian diets are healthful, are nutritionally adequate, and provide health benefits in the prevention and treatment of certain diseases." Well-planned vegan and vegetarian diets are appropriate for all stages of a person’s life. However, special care needs to be taken with children. A vegetarian diet can be unhealthy if it contains too many calories and saturated fat and not enough important nutrients, such as fibre. People who avoid meat are reported to have lower body mass index, lower death rates from ischemic heart disease; lower blood cholesterol levels; lower blood pressure; and lower rates of hypertension, and prostate and colon cancer. •Legumes, nuts and seeds: Soya beans, peanuts, kidney beans, split peas, lentils, almonds, walnuts, cashews, sesame seeds. •	Grains and cereals: muesli , brown rice, wholegrain bread, wholewheat pasta. •	Dairy or soya products: Look out for fat free and reduced calorie options for milk, yoghurts, cheeses. •	Fruit and vegetables: Use a variety of fruits and vegetables, including foods that are good sources of vitamins A and C.
Meatless products, such as tofu dogs, soy burgers, nut loaves or texturized vegetable protein, add variety to your vegetarian diet. These products, found in many grocery stores and health food markets, simulate the taste and texture of meat and usually have less fat and fewer calories. If meat, fish, dairy products, and eggs are not going to be part of your diet, you will need to get enough of these nutrients, or you may need to take a daily multiple vitamin and mineral supplement. Because women have a greater risk for getting osteoporosis as adults, it's particularly important for girls to make sure they get enough calcium. •	Legumes: lentils, chickpeas, and baked beans. •	Cereals: buckwheat, brown rice and wholegrain bread. •	Soya products: tofu and tempeh. •	Fruits and vegetables: calcium-fortified orange juice, green leafy vegetables, and dried figs. Vegetarians may have a greater risk of iron deficiency than nonvegetarians. Intake following products to avoid iron deficiency and anemia. •	Sea products: sea girdle, wakame and dulse are very high in iron. Eating these foods along with a food high in vitamin C (citrus fruits and juices, tomatoes, and broccoli) will help you to absorb the iron better. Check with your doctor about your own iron needs. You don't need to eat foods from animals to have enough protein in your diet. Plant proteins alone can provide enough of the essential and non-essential amino acids, as long as sources of dietary protein are varied and caloric intake is high enough to meet energy needs. •	Sea products: dulse is the highest in protein of the popular sea vegeatables. •	Legumes: lentils, chickpeas, kidney beans, white beans , mung beans. •	Soya products: tofu, soy milk and tempeh. •	Legumes, nuts and seeds: while grains, peanuts, kidney beans, split peas, lentils, almonds, walnuts, cashews, sesame seeds. This comes naturally only from animal sources. Fortified soy milk and fortified breakfast cereals also have this important vitamin. It's hard to get enough vitamin B12 in your diet if you are vegan, so a supplement may be needed. Zinc is needed for growth and development. Good plant sources include grains, nuts and legumes. Shellfish are an excellent source of zinc. Take care to select supplements containing no more than 10-12 mg zinc. •	Some types of cancer. Vegetarians also have lower rates of illness and death from a number of degenerative diseases. For much of the world, vegetarianism is largely a matter of economics: Meat costs a lot more than, say, beans or rice. Total vegetarian diet is not recommended for young children. The organisms of growing infants have enormous needs for protein, vitamins and minerals. Small deficiencies can have dramatic effects on development. One way to ensure that vegetarian children meet their energy needs is to give them frequent meals and snacks, and include foods higher in fat, such as dairy foods. The American Dietetic Association also considers well-planned vegan diets appropriate for all people, including pregnant and lactating vegan mothers, but recommends them supplement for iron, vitamin D, and vitamin B12. Vegetarian diets tend to be high in fiber and low in fat and calories. That may be good for people who need to lose weight or lower their cholesterol but it can be a problem for kids and teens who are still growing and people who are already at a healthy weight.